Newly upgraded chalet right on the ski slope, with sauna, open fireplace and free wifi. 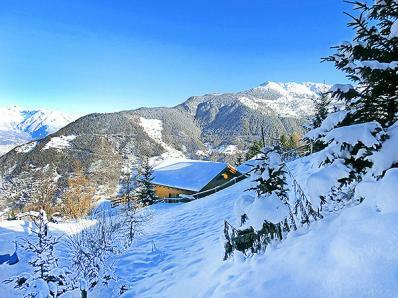 The chalet has high-quality equipment and is comfortably furnished. Environmentally friendly heating system via heat pump with partly underfloor heating; improved thermal insulation. Best spot to discover the 4 Vallées ski area: the freeride ski run to the gondola lift starts directly at the chalet (no official piste, at your own risk). Alternatively a 150 m walk leads to the piste with snow-making facilities and to the Etablons chairlift. The children's lift of the ski school is also ~150 metres away. The chalet is located on the upper outskirts of La Tzoumaz, with uninterrupted views over the Rhone Valley and the Bernese Alps. The bright, inviting living room with heigh ceiling (to the gable) offers comfortable sofas next to the open fireplace; The large dining table offers enough space for 8 persons. From the living / dining room you have access to the terrace. The exterior summer pictures were taken before the upgrade/extension of the chalet. Enjoy your breakfast or a barbecue on the panoramic terrace of the chalet; garden tables, benches and a free standing barbecue are available at the chalet.